Before we begin, watch Mike Lyndell take you to school on how to persuade. If you watch TV you’ve seen this ad. Every marketer I meet talks about it. But it’s never the type of ad they would be willing to make. I get it. We wouldn’t either. All that TEXT on the screen. The promo code that looks like a name tag from a job fair. The cross necklace OUTSIDE the shirt. The mustache. The over the top local car salesperson affectation. If Oxford Road had the chance to work with Mr. Lyndell on his creative I would give him examples like Dyson, Credit Sesame, or our work with LendingTree to show him how you can get the structure right AND have a style to your ad that isn’t offputting to certain audience segments. 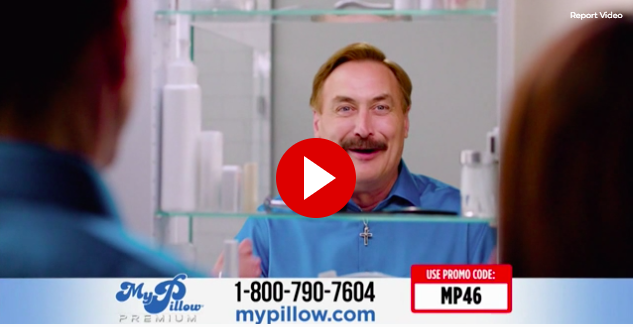 But before we throw this ad out of any serious creative conversation, keep in mind My Pillow’s revenue is reportedly $300 Million a year. I want to talk about its structure without debating the merits of the product. I count it a privilege to work at Oxford Road, where we only advertise products we believe in and would use ourselves. When it comes to My Pillow as a product, you can be the judge. But as for this ad’s structure, Audiolytics™ shall measure it’s true worth. Mr. Lyndell masterfully delivers the Nine Key Components of Audiolytics™, Oxford Road’s proprietary best-in-market message design and auditing system*. *We engineer every message we touch across 71 data points – the most comprehensive scoring system in the market – so that every Audiolytics™ certified ad drives maximum performance on every media dollar spent. The Nine Key Components of Audiolytics™ are Setup, Value Prop, Positioning, Demonstration, Substantiation, Offer, Scarcity, Path, and Execution. Without getting lost in the minutiae of our data points, I’ll just summarize what Mr. Lyndell does in his ad, and please feel free to take notes. He gets your attention, tells you about the opportunity his product presents and the pain that it solves, which is deeply felt and widely experienced. He perfectly positions his pillow against the status quo of not sleeping well AND other pillows. Then he demonstrates, and demonstrates, and demonstrates – showing and telling you exactly how it works. Last but not least, he substantiates his claims (often overlooked but very important – why should anyone trust you?) and then gives you a reason to ORDER NOW! The last component of Audiolytics™ is Execution. How is the ad made? Does it’s production value add or detract from the message? What is its style? This aspect of the ad is last for a reason. It is vitally important you know what you are saying and why, AND why it matters to your intended audience BEFORE you decide how you are going to say it. This is where many opinions might surface about the “quality” of the My Pillow ad. It feels like direct response. It feels cheesy. It feels like a Saturday Night Live spoof. It feels like Mike Lyndell is spending, by Alphonso’s count, $12 Million on this ad alone. This is only one of his 60-second ads. He has 120-second ads too. Could he dress it up and get Wally Pfister to shoot the commercial? Could he hire a big agency to tell an Epic Story like Tile? That’s the tens (or even hundreds) of millions of media dollar question. Would increased production spend, translating to a more tasteful ad with better polish lead to dramatically better performance? Does your ad’s style impact performance more or less than simply what you say? Have you ever thought about buying one of his pillows? You know the answer down deep in your sleep-deprived heart. Mike Lyndell is giving you a gift akin to when Patton read Rommel’s book. Patton didn’t want to join Rommel afterward, he simply recognized he could learn from a masterful strategist, no matter the source. You don’t need to make your brand look like MyPillow to sell like MyPillow. But you would do well to take a page from his structure, or ours. Click here to schedule your free Audiolytics™ assessment, and if you do really need a new pillow may we suggest Boll & Branch as well as Helix. Ad Budgeting for Grown-Ups: Applying the 70/20/10 RulePodcast Consolidation and Advertisers; What Do We Do Now?